The next beer on the list is Abita Abbey Ale. I normally drink Purple Haze made by Abita. This is also a wheat ale like the apricot ale. However, purple haze has raspberry infuzed in it. 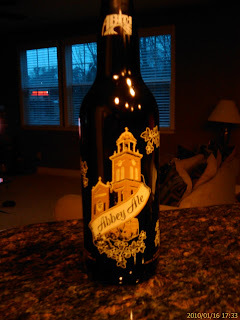 A description of the Abbey Ale can be found at the Abita Website. This beer is a nice dark brown and has a thick head. I can definitely smell cloves and hints of what seems like banana bread to me. Defintely smells of fruit. A very different taste from the apricot beer though, thicker and richer. This is fairly good. I would rate it a B in my book. whatstodotoday.com is officially gone in two days. Oh well. I have created the new page http://www.researchtriangleparknc.com to take its place. Its already shown up in the search engines so its defnitely doing better than the last site. However, one of our favorite places to eat in Holly Springs, La Dolce Vita, closed down. They had really good pizza and we hate that they are gone. They have another resturant in Sanford but we never really head that way. So I hit the Total Wine with the wife this afternoon for some beer. I was overwhemlmed by the types of beer they have. So I got 12 or so random beers for $40 (no one said they were cheap). So I think I'll use this blog to keep track of these beers and how they are. I actually got the first beer at our local Lowe's foods. The first time I had this beer was out in Seattle on a vacation. 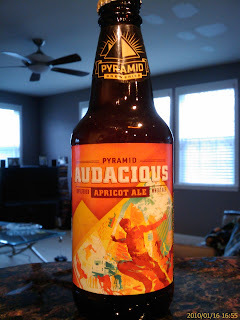 Pyramid Breweries makes the Audacious Apricot Wheat Ale and I'm a big fan of it. You definitely get apricot taste (I really like beer with fruit flavors). I'll start with this one tonight and see how the evening progresses.